Ms. Murphy is entering her 3rd year at DWCA and 1st as a teacher at the Douglaston campus. She will be teaching math for all 7th and 8th graders. 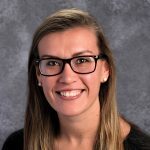 Ms. Murphy has earned her Bachelor’s degree in Math Education at St. John’s University, Master’s degree in Health Education at Adelphi University, and holds 3 different New York State teaching certificates in 7-12 Math Education, 5-6 Math Middle School Education, and K-12 Health Education. She has spent time in the East Meadow School District as a Permanent Substitute and as an Intervention Assistant helping middle school students with learning disabilities.